A long-running campaign for compensation for construction workers who were blacklisted for union activities has been formally brought to an end at the High Court. An agreed statement announcing the settlement of the litigation between members of the Ucatt, Unite and GMB unions and a large number of Britain's leading construction firms was read out on Wednesday to Mr Justice Supperstone who was due to try the case in London this week. But, a packed courtroom erupted when counsel for the companies, Andrew Caldecott QC, rose to offer their "sincere and unreserved apologies" for the damage caused. Led by Blacklist Support Group secretary Dave Smith, Mr Caldecott's words were drowned by cries of "No justice, no peace". Before counsel could resume, Mr Smith shouted to applause: "Under no circumstances do we consider this to be a sincere apology." Mr Caldecott said that appropriate sums by way of damages and costs had been agreed but no figures were revealed in court. Earlier this week, Unite announced it had reached a settlement which would see 256 workers receive more than £10 million in compensation. Unite said payouts could range from £25,000 to £200,000 per claimant, depending on such factors as the loss of income and the seriousness of the defamation. The GMB, which reached a settlement last month, said it understands the total value of compensation in the case was around £75 million for 771 claimants with legal costs on both sides estimated at £25 million. 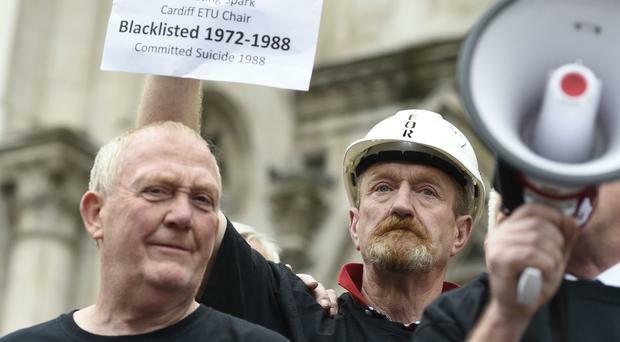 Blacklisting came to light in 2009 when the Information Commissioner's Office seized a Consulting Association database of 3,213 construction workers and environmental activists used by 44 companies to vet new recruits and keep out of employment trade union and health and safety activists. Some of those on the list said they were denied work, while a handful moved abroad because they could not find jobs in this country. A statement on behalf of Balfour Beatty, Carillion, Costain, Kier, Laing O'Rourke, Sir Robert McAlpine, Skanska UK and Vinci PLC - announcing the settlement of the litigation at the start of the week - said that, in October 2015, they acknowledged the system was unlawful in various respects and made a full public apology. "These construction companies wish to draw a line under this matter and continue to work together with the trade unions at national, regional and site level to ensure that the modern UK construction industry provides the highest standards of employment and HR practice for its workforce." Mr Caldecott said: "The defendants apologise as providers of any information and for the loss of employment suffered as a result of communication of information during the operation of the Consulting Association. "They also apologise for the anxiety and hurt to feelings caused as a result." He said they openly accepted and acknowledged that the essential failing of the Consulting Association system was its secrecy and the nature and content of the information it held. "They apologise generally for the fact that information was communicated and kept in secret and was not subject to any or any effective verification process." Maria Ludkin, GMB legal director said later: "All GMB could ever get for our members was compensation and a full apology. Today we feel truly vindicated to receive this apology for our blacklisted members. "Despite years of denials, today the greedy goliaths have been forced to apologise and account for their unlawful blacklisting." Before the end of the hearing, Blacklist Support Group member Roy Bentham told the judge that he wanted nothing to do with the money offered - but wanted a trial to go ahead with all the evidence presented. He intended to represent himself and get legal advice before putting his case forward. Gesturing at his companions in court, he said: "It has been a privilege to stand beside them and this battle will go on. "This will be judged in time because this hasn't been justice today. A lousy bit of compensation here and there is not justice. "The Blacklist Support Group disassociates itself from any public apology."